Rural Enterprises CIC began when we got the keys to an old chicken shed at Green Acres Farm in Staverton in August 2011. With a clear vision of what we wanted to create we set about raising funds to convert the shed into an office, a teaching kitchen with work stations for 8 pupils and an open meeting space. For the outside space we envisaged a greenhouse, vegetable gardens, raised beds and a patio area to enjoy quiet contemplation on a sunny afternoon. In the office space at the end of the shed we created a make shift kitchen and our first students arrived to learn about food in October. Thankfully this space has heating and lighting - very useful during those winter months when vegetable gardens and warm summer days seemed so far away. As soon as spring arrived we were outside breaking ground and creating our vegetable plot. Consisting of four beds it will provide food for pupils to pick and prepare for lunch. An understanding of how food is grown, why it is important for our nutrition and how to convert it into tasty and great value meals is sadly missing from much of the younger generation and is something we aim to encourage in as many pupils as we can reach, either at the CIC, in schools or via teachers through our CPD programme. Surplus crops will be made into meals and preserves for sale at local markets and fairs to raise additional funds. This will also give pupils the opportunity to understand how to promote, package and market produce. Each stage of the conversion from chicken shed to CIC has given the pupils an opportunity to learn how to take responsibility for themselves and each other, to work as a team and to show initiative. The pupils have enjoyed working alongside our staff and volunteers. 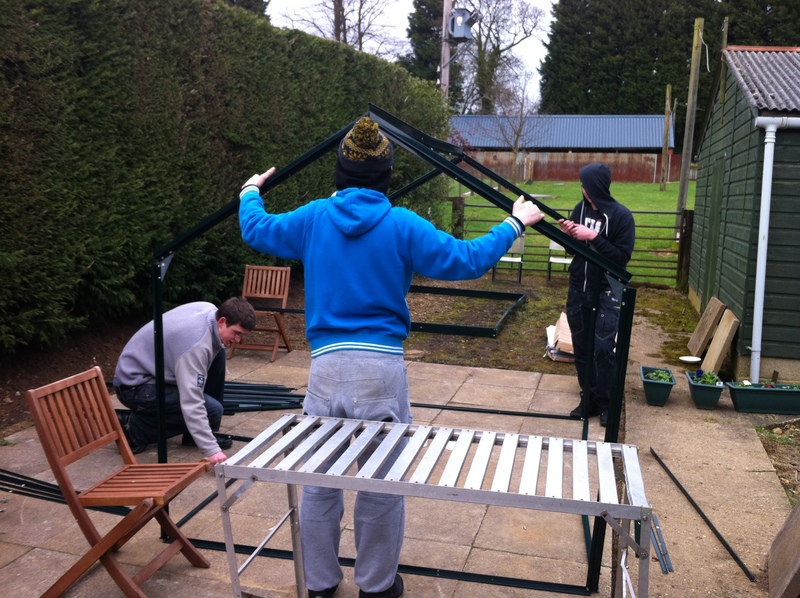 In the garden, laying the patio and constructing the greenhouse has helped them see the value of making a positive contribution, something they can now take with them into the world of work.